This classic Louis Vuitton design will undoubtedly please fans of the brand. It features Louis Vuitton's trademark brown tones in an elegant checkered design finished with a smooth chocolate leather trim. Four protective studs on the bag's base ensure it stays looking fabulous long after you take it home. 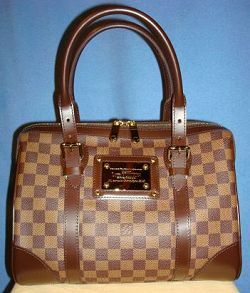 This handbag appears much like Louis Vuitton's popular Damier Speedy design. But unlike its saggy sibling, the Damier Berkeley retains its fine shape no matter how much, or how little, is packed inside. Inside you'll find a striking red micro suede lining and plenty of room. An interior cell phone pocket is a fantastic modern touch, and the exterior pockets are the perfect places for stashing spare change and house keys. Dual adjustable handles are an innovative touch that girls on the go will really appreciate. Louis Vuitton’s New Playtime Bag Charms | Purse Accessories Cute or Childish?